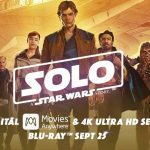 The post ‘Solo’ is Available Now on Digital Download and Screenwriter Jon Kasdan Shares over 50 Notes and Facts about the Making of the Film appeared first on Star Wars News Net. Need more details about Solo: A Star Wars Story’s “twist?” Here’s the canon overview. Lawrence Kasdan is retiring from Star Wars after the Han Solo Anthology film. Carrie Fisher Talks Star Wars at Wizard World Comic Con 2016!